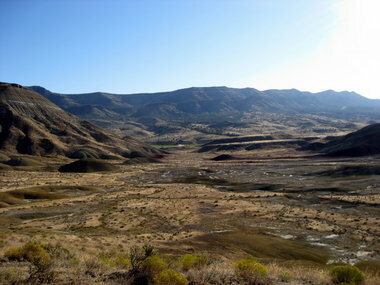 The scenery from the start of the Painted Hills Half Marathon. Photo by Patricia Goehring. The Painted Hills Half Marathon is a race you should run at least once in your life. Along with the half, there is a 10k and a 5k, all of which offer great views of the Painted Hills. It's a very small race, very supportive and the kind where you end up making new friends along the route. The first time I tried to run it, I found my plans changed by my now two-year-old daughter, with whom I had awful nausea, and ended up running the 5k instead. But I'm glad I stuck with my plans, because it was a beautiful race. 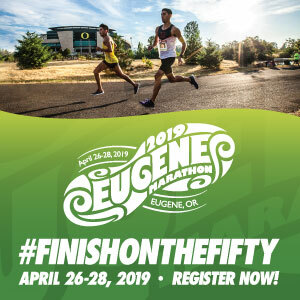 This post includes my recap from that gorgeous day in Mitchell, to hopefully entice you to make the trip to Central Oregon for this run! Where: Head to Mitchell and “look for the runners” – there will be a table for check-in and race registration and a bus just down the road. There will be porta-potties at check in. 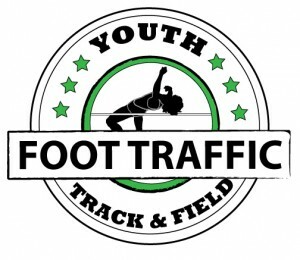 Register: You can print off a registration form here and send it tom Tom and Mary Fitzgerald by 8/15 for the best rates. Before then, it’s $15 without a shirt and $25 with; DOR it’s $18/$28. Part of the community’s Painted Hills Festival, the run is not large but it does attract a friendly and enthusiastic bunch of runners and walkers. Walker Sally Lynch of Tigard told me that she has made the drive for years to participate in the half marathon. The air was brisk as we all gathered in downtown Mitchell to collect our bibs and board the school bus that would take us to our respective starts. There were five porta-potties, set up mainly for the day’s festivities but more than enough for the roughly 30 participants. The bus shipped out at 8a, headed to the half marathon start in the John Day National Monument’s Painted Hills. On the way there, us out-of-towners (me and my mom, who was visiting from Iowa and would walk the 5k) were treated to local knowledge of the Painted Hills and the course. The bus leaves as the half marathoners make their nice downhill start at the 2011 Painted Hills Half Marathon. Photo by Kelly Barten. Before long we were at the half marathon starting line. The bus stopped, many people got out to walk around, and the half marathon started right on time at 8:30a. Lynch, the walker, had started early so she’d be finished by the awards ceremony scheduled for 11a, leaving just four men and one woman to run the 13.1 from the regular start. The 10k and 5k runners loaded back on the bus and we headed to the 10k start, where again, most people emptied the bus. The timer watched as the minutes counted down and then the five 10k runners were off. Again, we passed by them after loading up again on the bus to head to the 5k starting line. The travel time between the half and the 10k start was obviously much longer than from the 10k start to the 5k start; we arrived with just over a minute to spare. Because the sun was already high in the sky, I took advantage of the organizer’s offer to leave any warm-ups on the bus to be delivered back to the finish line. A quick countdown, and we were off. 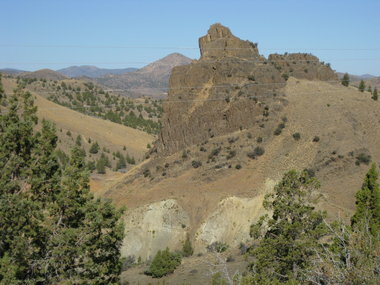 Some of the scenery from the last few miles of the Painted Hills Half Marathon. Photo by Patricia Goehring. Eventual winner of the women’s 5k Julie Maenhout and I took off at a quick clip along the gravel road. We were on the gravel for less than a half mile before we took a right turn onto the Service Creek-Mitchell Highway and saw a nice long downhill stretch ahead of us. We continued chatting about the scenery and her fieldwork, she pointed out various land formations, and before we knew it we were passing a mile marker that was a black flower pot with “11” painted on the side. Since the 13.1 lined up neatly with the 3.1 of the 5k, we were able to pinpoint our pace. Before long we could see Highway 26 (and across Highway 26 to the Mitchell cemetery, which was neat to see from above) where there was a volunteer there to hold traffic as the runners came through. With only about a half mile to go, we turned onto 26 and headed towards Mitchell. The section on 26 was flat, but upon turning onto Main Street, there was a slight downhill followed by a very gentle uphill. The town was getting ready for the day’s parade, and as I finished I passed by the high school volleyball team painting their signs and the Red Hat Ladies in a classic Thunderbird. 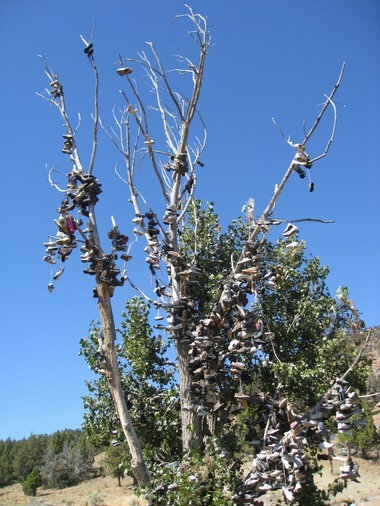 The shoe tree, near Mitchell. The finish line neat and organized with event directors Tom and Mary Fitzgerald taking times while another volunteer tore bib tags. There was water, energy drink, bananas, and oranges for the finishers; I congratulated the first two women and the man who’d finished just ahead of me (at age 73! ), grabbed a few snacks from our car and walked back out to meet my mom, who was walking. I was able to see the 10k and half marathon winners and caught my mom just before she crossed Highway 26. The awards ceremony was held at 11a, with many participants going home with hardwear. I got an engraved medal for my 3rd place finish and a red ribbon for my 2nd place age group finish, and my mom, who walked, also got a silver medal and a blue ribbon – her first awards!